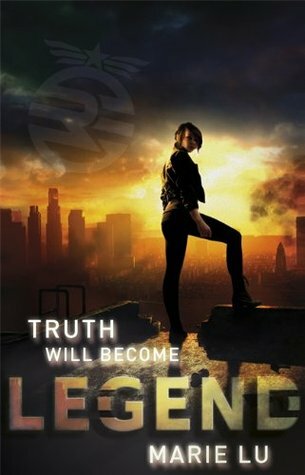 The truth they'll uncover will become legend." The UK cover is somewhat reminiscent of the original Divergent cover for me. That doesn't make it any less stunning though. Its almost like the girl standing there has the world at her feet - like she is powerful. I also like the setting sun, its kind of provocative to me in that things are going to go down!! You start the story reading from the view of Day - a boy on the wrong side of the law. He lives to cause havoc for the Republics wealthy and to look after his family. You find his family has been marked as plague victims and so starts his mission to save them. I was rather shocked to read of how the poor are treated in this world. It left me with a feeling of fear for them, but also for us. Marie uses the facts of today, like growing population and lack of resources and builds a new warped version of the world. I do find when I read dystopian tales like this I wonder - What if??? The next chapter shifts to another character JUNE - it also switches to a new font, that was so helpful - you can just look at the writing and know who's side of the story is being told! June's life is greatly different to Day's, she is rich and privileged. Through actions in the story though she becomes the sworn enemy of Day and so her story of revenge begins. I found it utterly fascinating to read of the diversity of the characters life. How much like in our world today being born to some people can bring great fortune and to others bring great suffering. Its actually great thinking material for the life we live now. Sometimes the grass is not greener on the other side, but just sometimes I think it is. For me the story although interesting dragged a little in the first half, but the second half was so much more exciting. It was in this half that revelations started pouring out and you could see where the story was going. At this point I was utterly enthralled. The book concludes on a somewhat shocking note, but is a great set up for the next part. I'm just not sure where the story is going and that is so attractive to me - I want shocks and think I may just get some!! This is a brilliant debut that not only had me questioning the world in the book, but the world be live in today. Great review I really enjoyed this one. I think I prefer this cover over the US only too. Glad you enjoyed it even though you found it slow at first! I've been swaying between wanting to read this and not but I think after your review i would really like it! Fab review, I really enjoyed Legend and am really looking forward to the sequel! Valentines GIVEAWAY!! Delirium UK HB And SWAG! !